We asked our members, many of whom grew up on classic coastal Southern cooking, to bring us their all-time favorite recipes. The result is Harbor Island Celebrates! Vol. 2 ... tips for island living, a collection of the best dishes we serve to our own families, friends and drop-ins. Recipes include Southern classics such as Tomato Pie and Cornbread and coastal specialties such as Shrimp Creole and Wahoo Salad. Packed with 330 tips and recipes from the Carolina coast, our cookbook is a perfect gift for out-of-town visitors, hostesses, holidays and teacher's gifts. All proceeds from the sale of Harbor Island Celebrates! go directly to our gardening and beautification programs. 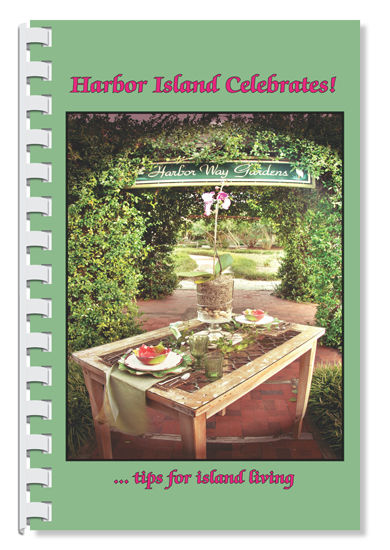 Harbor Island Celebrates! Vol. 2 can be found in local specialty stores (Thrill of the Hunt, Home Again, Bangz, Redix, Wrightsville Beach Museum) or CLICK HERE to purchase a cookbook online for just $20 + shipping. For more information or for wholesale pricing, contact Jan Kelly at msjanwb@aol.com. Place shrimp in 13x9 pan; top with lemon wedges and bay leaves. Stir together butter and ketchup, Worcestershire sauce, garlic, Old Bay, rosemary, and thyme. Pour over shrimp. Bake uncovered at 400 degrees for 35 min., or until shrimp are pink. Stir every 10 min. Discard bay leaves and serve. Suggest serving with fresh French bread and real butter, orzo, and fresh fruit.